After the release of his “Liquid Metal” DVD, Morgan Strebler has become well known in association with metal bending. The performer displays 2 forks, one in each hand. A spectator chooses one of them. The performer places the non-selected fork in his back pocket as he turns his attention to the chosen fork. He puts a lot of mental concentration on the fork, and has the spectator touch the fork with her finger. Mysteriously, a cockscrew twist is found at the neck of the utensil. More concentration and more personal touching by the spectator – the tines part of the fork now bends at the neck and finally breaks off and falls onto the floor. The performer brings out the other fork from his pocket. He causes 2 cockscrew twists to occur at one end tine. This tine is then bent at right angle to the rest of the tines. Another tine now bends at right angle but in the opposite direction to the first tine. The 2 middle tines now bend away from each other, and the entire tine structure looks like an X or a 4-pointed start. After the audience recovers from their shock, they find that there are now 2 bends at the neck of the fork. The entire fork now looks like a beautiful piece of art. It is given away as a souvenir to the spectator who helped the performer. You receive a well-produced DVD with Morgan Strebler performing and explaining the entire routine. This routine requires you to prepare the forks in advance. Morgan also teaches an impromptu version where you can use a borrowed fork. This impromptu version does not include the cockscrew twists. The final twisted fork looks like the one in the first routine and you can give this away to a spectator as a souvenir. 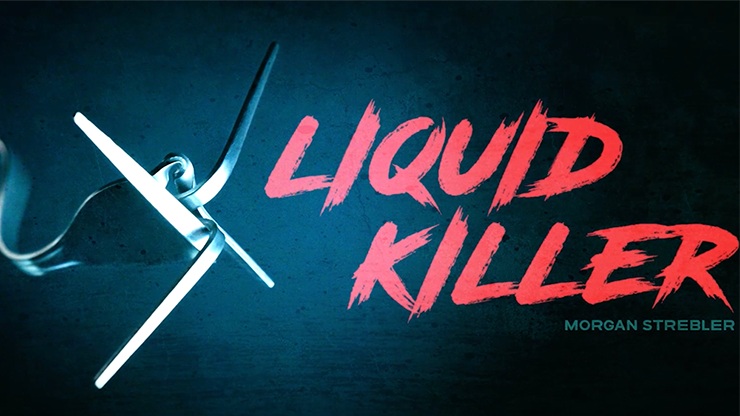 The strong point of Liquid Killer is the multi-phase routine that helps build up the suspense, culmulating to the final artistic piece that can be given away to a spectator. The delighted spectator can use this souvenir as an advertisement for you.